ARN’s convenient, online Certified Rehabilitation Registered Nurse (CRRN) Review checks your knowledge in preparation for the CRRN examination. 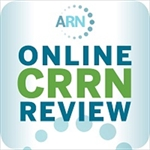 The CRRN Online Review is delivered in a unique and highly effective self-guided environment using a multiple choice question and answer format. Using a sophisticated algorithm, the course moves you through those things you already know efficiently, and focuses your attention on areas where you need to improve. Task 1: Incorporate evidence-based practice, models, and theories into patient-centered care. Task 1: Apply the nursing process to optimize the restoration and preservation of the individual's health and well being. Task 2: Apply the nursing process to promote optimal nutrition. Task 3: Apply the nursing process to optimize the individual's elimination patterns. Task 4: Apply the nursing process to optimize the individual’s highest level of functional ability. Task 5: Apply the nursing process to optimize the individual's sleep and rest patterns. Task 6: Apply the nursing process to optimize the individual's neurological function. Task 7: Apply the nursing process to promote the individual’s optimal psychosocial patterns and holistic wellbeing. Task 8: Apply the nursing process to optimize coping and stress management skills of the individual and caregivers. Task 9: Apply the nursing process to optimize the individual's ability to communicate effectively. Task 1: Collaborate with the interdisciplinary / inter-professional team to achieve patient-centered goals. Task 2: Apply the nursing process to promote the individual's community reintegration. Task 1: Integrate legislation and regulations to guide management of care. Task 2: Use the nursing process to deliver cost effective patient-centered care. Task 3: Integrate ethical considerations and legal obligations that affect nursing practice. Task 4: Integrate quality and safety in patient-centered care. Once the CRRN Online Review is purchased, please review your email receipt carefully regarding additional instructions on how to access the course. 1. Demonstrate knowledge and application of principles and processes integral to rehabilitation nursing across each of the domains and tasks included in the CRRN examination. 2. Identify care strategies used to improve health and function of patients in the rehabilitation setting. 3. Understand the nursing process employed in patient-centered care. 4. Integrate legislation and regulations to guide the management of patient-centered care. Success on the practice exam cannot guarantee positive results on the certification examination. ARN recommends use of The Specialty Practice of Rehabilitation Nursing: A Core Curriculum and/or The Professional Rehabilitation Nursing Online Course as additional resources for those areas where the learner identified that additional study is needed. In accordance with the American Nurses Credentialing Center’s Commission on Accreditation (ANCC-COA), all continuing nursing education providers are required to disclose to the activity audience the presence or absence of relevant financial relationships of the planners, teachers, and authors involved in the development of continuing nursing education content. An individual has a relevant financial relationship if he or she, or his or her significant other, has had a financial relationship in any amount in the past 12 months with a commercial interest whose products or services are discussed in the continuing education activity content over which the individual has control. Any potential conflicts have been resolved prior to the activity. Information on such relationships will be disclosed either in writing in program materials or verbally in advance of the activity. The material presented represents the opinions of the program developers and not necessarily the views of ARN. The planning committee and program developers have nothing to disclose. If you encounter problems with any part of this activity, please contact ARN via e-mail at info@rehabnurse.org, or call us at 800.229.7530. I have been using several study aides to prepare for the upcoming exam and having trouble "knowing what I know". Then I purchased this online review course and I am so glad that I did. The format is so intuitive, constantly reviewing the information that I had difficulty with, giving rationales for every answer and I can repeat the review over and over! The fact that I get ceu's as well is just a perfect bonus. I am feeling more and more confident about taking the exam!